Singapore based artist Sean Lee has had his little Qbie Dino fall outta space as Jeremy Tanavit aka Tanavit23 & The Hodophile collaboration brings you this custom Qbies Dino! The Hodophile came up with custom Astro idea and Jeremy sculpted the scales and back pack. Buzz Lightyear eat your heart out, HA. 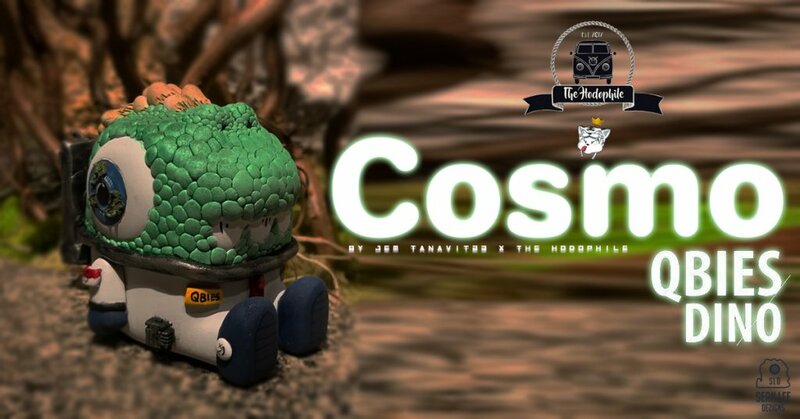 Where no dino has gone before, Cosmo Qbies will be joined by a range of customs for the Sean Lee custom show at FLABSLAB in March. Stay tuned for Sean Lee Show info and how to purchase Cosmo Qbie! http://flabslab.bigcartel.com/ for more art collectables and http://seanleedesign.storenvy.com/ for more Sean Lee goodness. http://seanleedesign.storenvy.com/ for more Sean Lee goodness. You can find Tanavit23 via his Instgram and Twitter.